Home / drugstore makeup / makeup / makeup haul / "I like long, romantic walks through makeup aisles"
"I like long, romantic walks through makeup aisles"
I've always been a bit snobbish when it comes to makeup. 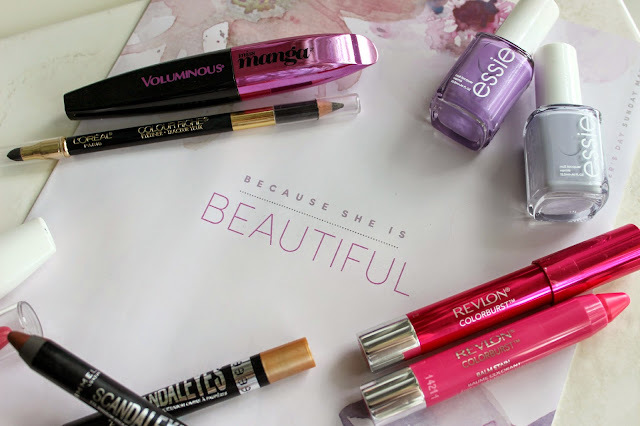 I generally prefer high end items to drugstore, and use to choose wondering through the aisles of Sephora any day to Shoppers Drug Mart, one of the the best and most popular drugstores in Canada. But more recently, I've been having a bit of a fling with lower end bits. The quality of drugstore items has really surpassed many of my expectations, and more importantly, they have sales. Like, lots of promotions and deals, and they change all the time. Sephora, take note. Recently, I've been quite partial to the Revlon lippies which always seem to be on sale. From the new HD lipsticks, to the Colourburst range, and my all time favourite Lip Butters, there is always a great promotion to lure you in. And the new (to Canada) Burt's Bee's lip crayons are to die for. Incredibly pigmented and moisturizing, my only regret is not buying more when there were bonus optimum points offered (#givemeallthecolours). I've also found that I prefer drugstore mascaras to high end ones. Mascaras dry up so quickly, and I can't justify spending 30$ on something I need to throw out in a few months. My current favourite is the Physicians Formula Organic Wear one, which has such curl and lift to it, I don't even need to curl my lashes. 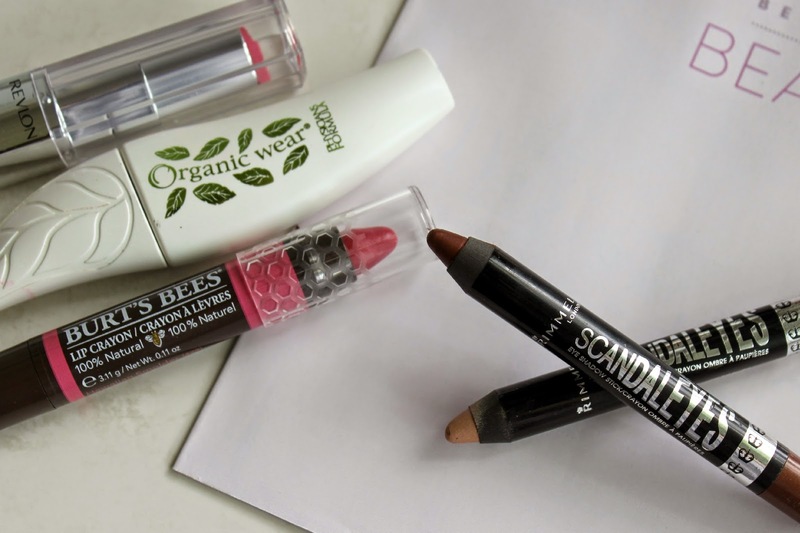 Keeping with the eyes, I've recently tried out the Rimmel Scandaleyes eyeshadow sticks. While they smudge ever so slightly on my oily lids, I love quickly blending them in on days I'm running late. They're also great at keeping in your hand bag if you want to amp up your look later in the day. Lastly are the Essie polishes, that always seem to be on sale. I'll admit to stocking the shelves, trying to find particular colours, and coming home and immediately painting my nails with them. You can never had too many colours, right? Shoppers Drug Mart has undergone some changes in the last bit, and have really stepped up their game. From the BeautyBoutiques to the Murale stores, they isn't a shortage of beauty items. 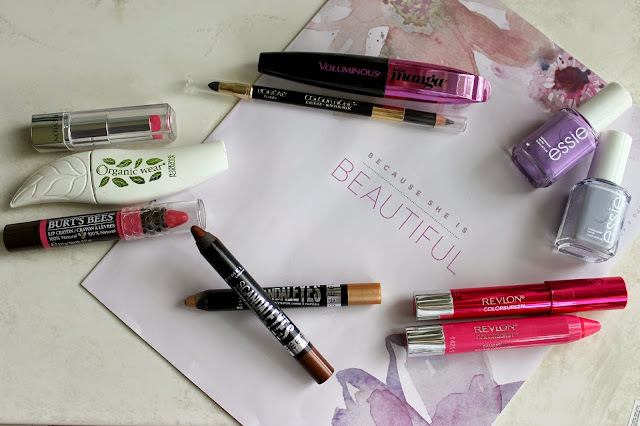 While there are still the regular lower end lines, like Revlon, Maybelline, and Rimmel, you can also find a lot of luxury items in store as well. Bourjois, Benefit, Smashbox, Clarins, among many others, line the brightly lit shelves of the BeautyBoutique ranges, found in many shoppers locations. Murale is a standalone store, with my favourite location being the one at Shops at Don Mills. It's very compatible to a Sephora, with top notch brands, knowledgable staff, and unique items. I love roaming through the Chanel and YSL sections best, but the skincare area at the back is amazing. I was recommended the Juice Beauty brand earlier in the year by a sales associate after complaining about my persistent acne, and have noticed a significant difference in my complexion after trying it out. Tata Harper, Rodial, and Eve Lom are just some of the other amazing skin care offerings. While I don't think I'll give up my love of high end makeup any time soon, I think that the variety of options at Shoppers Drug Mart will satisfy all of my needs.